I recommend sending invitations in the mail about three (3) months before a destination wedding. This allows guests plenty of time to make travel arrangements. Also, be sure to send Save the Dates much earlier … think anywhere from 12 to 6 months before the big day. It can be helpful to have your wedding website up and ready to go when you send out Save the Dates. It doesn’t have to be perfect, but if you can have information about accommodations, or places to see while they visit, it can go a long way! A note on the gallery above: If you have a flexible budget, it is fun to include something unique, like this die cut Michigan RSVP card or this custom watercolor map! This is something we can design for our custom stationery clients. To learn more about that process you can click here. The above images are from a wedding with Sincerely Ginger Weddings. Photography is by K.R. Moreno Photography and the florals are by Bloom Floral Design. You often hear that your stationery sets the tone for your wedding. I think this is especially true for destination weddings! There are so many fun things you can do to get your guests excited. Do you have an epic venue? Custom venue illustrations or maps can be a really fun touch to your stationery. Just be mindful that extra details can also add up in the overall costs! 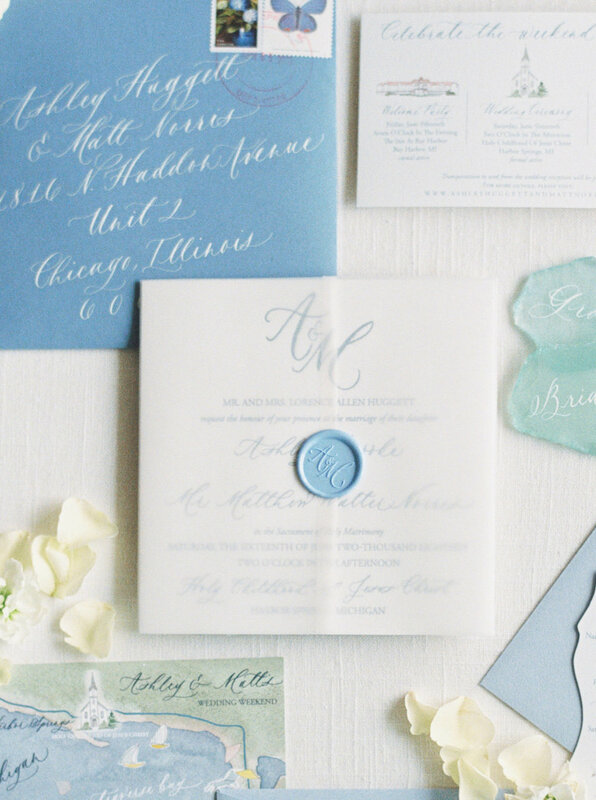 We offer semi-custom wedding invitations (see the pretty pictures below!) which share a glimpse of the natural beauty of the destination through watercolor details. This is a great way to wet your guests’ appetite without breaking the bank! 03. Share your faves with your faves! That’s right, give your guests a list of things to do. You can include this in the Invitation Suite or Save the Date. To save a little money, you can skip that detail and add it to your wedding website. Wedding websites are super important now that people do everything online and sharing a list of your favorite restaurants and special spots will help get your guests excited. They can start making plans right away instead of wasting time searching Yelp reviews. 04. Have fun with the details! 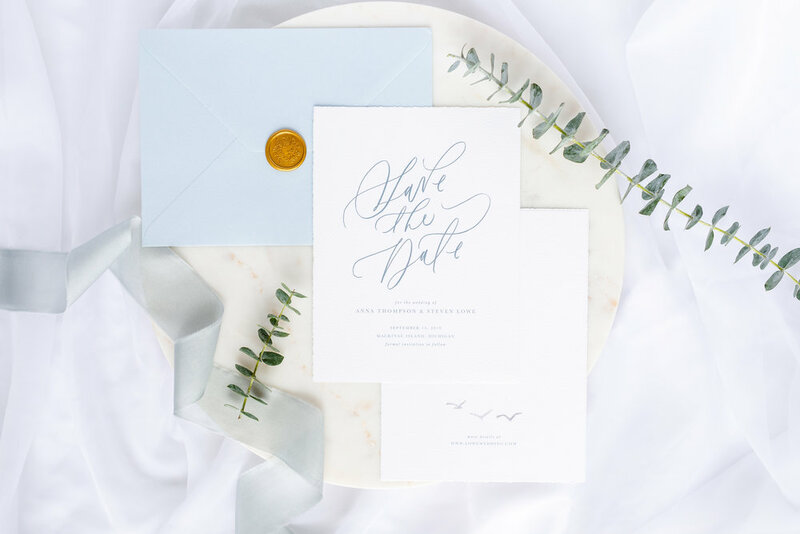 The Wedding Invitations and Save the Dates are a great place to infuse a little extra personality, while keeping a very classy and elegant look. Postage stamps are a great example of this! Don’t splurge on all vintage postage! Vintage postage is beautiful, but it can cost 3-4 times the face value of the stamps, depending on how rare they are. If your invitations cost $1.20 to mail, they may cost $4-$5 each for all vintage postage (and that does not account for the RSVP Envelopes). There are some great options through the USPS website that look vintage (pst…these are my favorite!). You can mix a couple of forever stamps with just one or two lower face value vintage stamps to get the look you want for less! 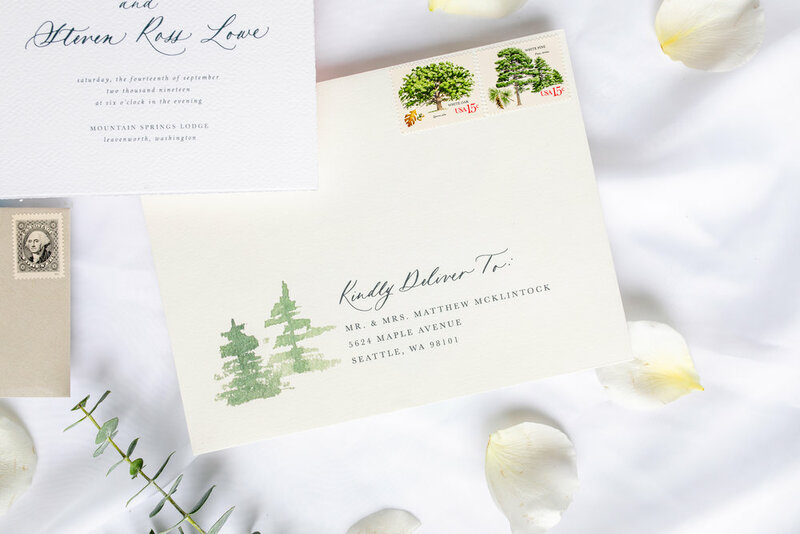 For personal accents, look for vintage stamps from the state your wedding will be in, the states you are from, or flowers that match your wedding colors! Now for some pretty inspiration! Below are some of my favorite images from one of my Semi-Custom Invitations Suites! Design 06. Terrain features delicate watercolor illustrations which build anticipation for the natural beauty of your wedding destination! We currently have three options: the lake, the woods, and Red Rocks. If you love this design but don’t see your terrain, just ask us! We may be able to add it to our collection! The images below are styled and shot Stephanie Parshall. She did an amazing job at capturing details and I highly recommend checking out her work! The suite is digitally printed on our signature Rossi paper, which has gorgeous, subtle deckled edge! 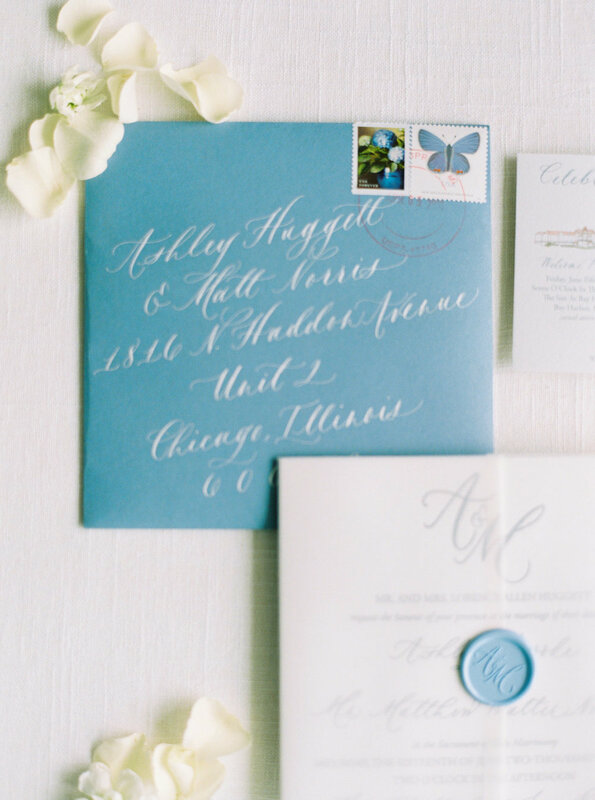 Need more than wedding invitations? We also offer corresponding Save the Dates, Menus, Place Cards and more for all of our collection designs. Just ask us! Click the link below to get started! I would love to see if we can work together!